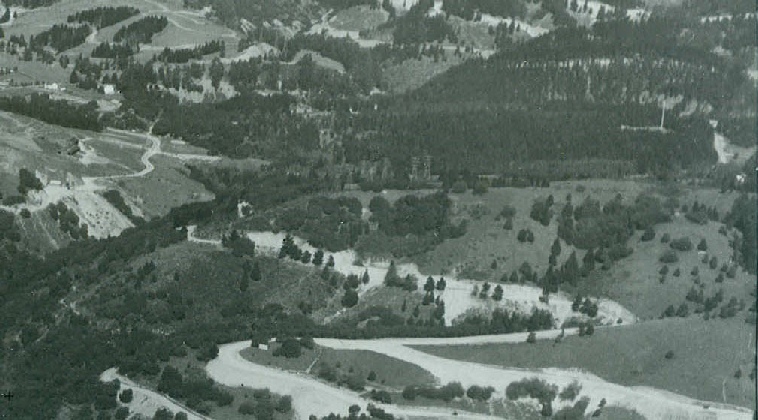 The first semi permanent Scout Camp of the Oakland Area Council was located at the top of upper Dimond canyon from December of 1917 until January of 1919. The location of the camp was in the Oakmore Highlands area of Dimond near the present day Leimert Blvd and Bywood Drive intersection. 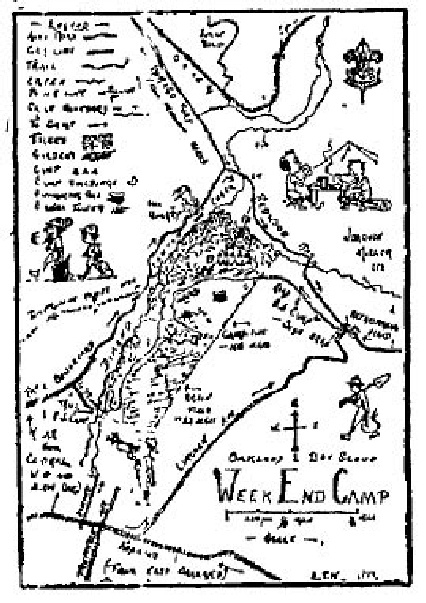 It is also interesting to note that the location of this week-end camp was only a “stones throw” away from the site that would ultimately become Camp Dimond as the two sites were only a half mile away from each other. The small camping area was provided to the scouts on behalf of the San Francisco-Oakland Terminal Railways Company which owned the land. Six tent houses with bunks were fitted up and food and lodging was provided free for 100 boys who attended the Christmas camp and helped clear the brush and poison oak from the site for the spring camp. In an article from the Oakland Tribune on December 24, 1918 was written, “During the past week, excellent progress has been made on the new week-end camp now being developed at the mouth of Upper Dimond canyon. An average of 50 boys have been working' each day in clearing away the brush, and the site is already beginning to take on the aspect of a typical scout camp. Headquarters has offered a "tuck-cart" or hauling wagon, to the troop piling up the largest amount of brush during the holidays, and as a result several of these piles are already beginning to look like miniature mountains. Six floored tents for overnight accommodations for the boys have been put up, and also a large cooking tent where three well-cooked meals are prepared for the boys each day. Camp Director AJ Kent is very optimistic over the prospects of this preliminary work being entirely completed by the end of the holidays, as a 100 boys a day are expected to be on the job during the two weeks after Christmas. As soon as the brush is cleared away, the construction of the large recreation hall, swimming pool, camp directors headquarters and observation tower will begin, and it is expected that all of this work will be completed by spring. The already familiar slogan “every Scout to feed a soldier” will be applied at the camp, where a large acreage of land will be developed for agricultural purposes. The local Glenview Womens Club donated the funds to build the camp house for the scouts at the new scout camp. At the beginning of February in 1918, Hollywood’s most popular actor, silent screen star Douglas Fairbanks paid a special visit to the weekend camp to observe a Scout “Round-Up” that was being held. Fairbanks was in Oakland promoting the sale of War Bonds and was invited to the camp by HC Capwell, President of the Oakland Area Council.